CarGurus has 5,987 nationwide Navigator listings starting at $1,890. After a rather intriguing debut at the 2016 New York Auto Show, Lincoln’s next-gen Navigator, sorry to say, won’t be the part of the 2017 Navigator lineup. For the upcoming year, this full-size 7- or 8-passenger luxury SUV is expected to soldier on with minimal changes, though a new standard 17-inch E-coated steel spare wheel and a couple of new exterior color choices, Palladium White Gold Metallic and Riviera Sands Light Brown, have been confirmed. Cargo area floor mats are also now available as an option on the base Navigator Select trim and standard aboard the flagship Navigator Reserve. Both 2017 Navigator trim levels are expected to again be available in either the standard-length variant or a stretched version designated "L." Standard-length Navigator trim levels will again measure 207.4 inches (13 feet, 3.4 inches) in overall length, with a 119-inch (9-foot, 11-inch) wheelbase, while Navigator L iterations will stretch to 223.3 inches (18 feet, 6.3 inches) overall, with a 131-inch (10-foot, 11-inch) wheelbase. Cargo area in the standard-length variants is slated to return at 103 cubic feet with the rear seatbacks folded, or 128 cubic feet in the Navigator L. All trim levels offer standard power-folding third-row seatbacks, making loading much easier. Rear-wheel-drive (RWD) should come standard, with a light-duty 4-wheel-drive (4WD) system with no low-range gearing available on both trims. A 3.5-liter twin-turbocharged V6 powerplant combines with a 6-speed shiftable automatic transmission to put out 380 hp and 460 lb-ft of torque. Look for this forced-air V6 to mirror current mileage figures of 16 mpg city/22 highway/18 combined in RWD standard-length versions, 15/20/17 in 4WD standard-length trims, 15/19/16 in RWD L editions, and 15/19/16 in L versions with AWD. The 2017 Navigator is also expected to boast a 9,000-pound max towing capacity with its standard heavy-duty tow package, perhaps the highest in its class. Reviewers are impressed with the handling attributes of current editions of this big ute, especially since the Navigator, like its Ford Expedition cousin, rides aboard an F-150 full-size pickup chassis. But keep in mind it’ll still be a challenge to park your Navigator (especially the L) in a crowded lot. 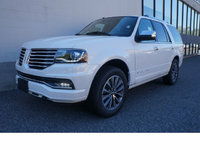 Look for 20-inch (Select) or 22-inch (Reserve) alloy wheels, a power liftgate, power-folding running boards, and heated power mirrors to remain standard on the Navigator's exterior. Cabin comforts and conveniences aboard the Select in both standard-length and L versions include leather upholstery, heated power-adjustable front seats, memory for driver settings, second-row captain’s chairs, keyless entry and ignition, and full power accessories. Further standard goodies are slated to include cruise control, telescoping tilt-wheel steering, a remote garage door opener, remote engine start, dual-zone automatic climate control, a power-folding third-row seat, and an auto-dimming rear-view mirror. Again, the Navigator Select is expected to feature Bluetooth-integrated Sync 3 infotainment technology with smartphone apps and a navigation system, and, for entertainment, a 14-speaker THX II premium audio setup that includes a DVD player, a video monitor, satellite radio, and a memory card slot. 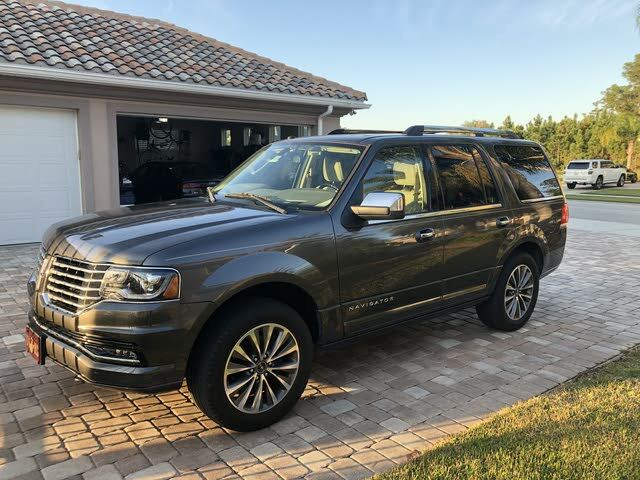 The Navigator Reserve adds standard adaptive suspension dampers, upgraded leather upholstery and extended leather cabin accents, new carpeted cargo floor mats, and a 2-tone exterior paint scheme. Options for the upcoming year’s Navigator stable are slated to include a power sunroof, heated second-row seats, second-row bench seats (8-passenger capacity), and rear-seat DVD entertainment. Standard safety equipment expected to return aboard the 2017 Navigator includes 4-wheel antilock brakes, traction and stability control, dual front side-mounted airbags, 3-row head curtain airbags, front fog/driving lights, and daytime running lights. Further returning safety features include turn-signal-integrated mirrors, high-intensity-discharge (HID) headlights, a post-collision safety system, and a remote antitheft alarm. Both Navigator trims will also feature Ford’s SOS post-collision alert technology and its MyKey programmable speed- and audio-limiting system, designed for the safety of younger drivers. The Current Navigator was awarded 5 out of 5 stars for overall crashworthiness in government crash tests, but the Insurance Institute for Highway Safety did not test the Lincoln due to its massive size. The Navigator that appeared at the New York Auto Show was a gull-wing curiosity that featured a cascading 3-step power-folding running board, wide-screen rear-seat DVD entertainment, nautically inspired stowage systems (including a wardrobe management feature), and a tweaked V6 that Lincoln claims will put out over 400 hp. Unfortunately, it seems this futuristic SUV, called the Concept Navigator, won’t be appearing in dealer showrooms until manufacturing begin for the 2018 model year, perhaps late in 2017. What's your take on the 2017 Lincoln Navigator? Have you driven a 2017 Lincoln Navigator? I have 2017 navigator l with 14,000 mile & is it safe to use full synthetic oil like Mobil? What Is The Average Additional Value Of Having A Vehicle CPO ? I am so mad because saw the car in one price and the person that answer the phone say thats a mistake but is not true bacause de car appears equal on the web. It is a fraud o bad publicity.